When my wife and I moved to North Carolina from Arkansas, our one-year-old daughter was teething. Our older daughter, four, rode with me, while our screaming younger daughter rode behind us in my wife’s car. I was driving a Ryder truck, pulling my car, and by the time I add up these details, whoever is listening is either laughing (men), or wearing a pained, concerned look (women). Some of the men will apologize for laughing—these are the fathers. Some of the women will nod—these are the mothers. Couples with children always exchange a look when I get to the part about having to pull over every 45 minutes to walk a screaming child up and down the interstate while the wind of semis blasts past. The Appalachians were difficult to maneuver in the big truck. We grew more exhausted each time we were forced to stop, and by the time I’ve finished this story—older daughter skinning her knees as she fell running toward our new house in North Carolina—my audience is shaking its collective head at what an ordeal I’ve been through. I tell this because it is one of only two moving stories I have, and because I was reminded of it while reading Jill Talbot’s The Way We Weren’t, which is about moving. Or I could say Jill Talbot’s memoir moves. I like that better. The Way We Weren’t moves. From city to city and state to state. From Colorado to Utah to Montana to Idaho to Oklahoma, a wandering through the West before heading north and east and west again. It moves from wine lists to syllabi to photographs, pennies left to bring luck in places just abandoned. Furniture dragged to roadside trash. From third person to first and back again, the author writing herself as a character as a way of distancing, pulling back to see the picture she keeps trying to find. It begins with a picture. And a pregnancy test. It begins with Kenny, the man she loved, leaving, though “it’s true,” Talbot tells us early, that she left first. Her leaving marks the period where she and Kenny “were in orbit, taking turns being the sun.” It also marks the beginning of Talbot’s moving from place to place, but just as a pregnancy test is more than an indicator line or a picture so much more than the river in the background, Talbot‘s story means more than places pinned on a map or boxes loaded into the back of a car. Kenny leaves, and Jill Talbot moves. From Colorado to Texas. From Texas back to Colorado. From Fort Collins to Boulder, together. From together to alone when Kenny finally leaves forever. From basement apartments to second stories where all her neighbors seem to be moving as well, but to the bottom of a bottle instead of the road. The bottle (Chardonnay or Merlot or Cabernet Sauvignon, whose own stories we hear told in “Wine List”) causes another move, this one to Utah and rehab, where Talbot begins writing her autobiography, laying out bones and blood and breath, all the intimate details of a life we haven’t lived but are drawn to like moths circling a late-night porch light. After Utah comes Montana, where a last-minute email sends the author to Idaho, but these moves are just the tip of the iceberg. What lies beneath the surface is her relationship with Kenny. It moves with her, from late-night phone calls and messages left on voice mail, to letters sent to old addresses that will never be read. From shared stories to absences, late nights waiting for a return, for headlights to sweep the wall, hoping his blue truck pulls into the drive. In the recountings of the relationship, we move through the wild swing of human emotions, from sadness to despair to hope. Talbot writes the story of Kenny again and again, changing it with each telling, until Kenny is only a story, a memory of a man she finally leaves behind when, headed for Chicago and a basement apartment she and her daughter will hunker down in for close to a year, she fails to forward her address. What words he might say, Talbot tells us, are only lost calls. It is in her writing where he hums. The memoir, she says, is fiction, no matter how much truth is in it, but when she dreams of Kenny looking back for her she says “I no longer wonder why he looks back. . .It’s something we all do, whether we want to or not.” Part of moving then, is looking back at where we were before. 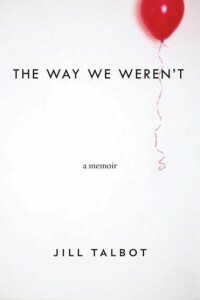 Like Hemingway, who surfaces several times in the memoir, Jill Talbot writes the past in an attempt to be free from it. Her daughter, Indie, does this. I deliberately use the vague pronoun “this,” because to Talbot, Indie is more than the past, more than being free from it. She exists between borders, “. . .the before and after. . .the parent she knows and the parent she doesn’t.” But Indie moves as well, from pregnancy test to infant to adolescent to fellow traveler. To partner. To friend. To see her grow through the pages is to see the purpose that drives the author from job to job, a transient professor chasing tenure around the country in one or two-year gigs. At the end, when the two of them—whooping, raising their hands to the roof—cross the border into New Mexico, we have swung away from sadness. Kenny has been left behind, except in the words. What lies ahead is hope, a word that sounds a lot like home. “How symbolic, this transition from innocence to experience,” Talbot writes, quoting Blake, and I don’t know if she means herself, her daughter, or all of us. I don’t care. It’s a beautiful line, in a beautiful book, one that captures the many different ways the memoir moves. That’s enough. “We write the way we were,” Talbot says, “or the way we weren’t.” I would add that Talbot’s memoir is the story of how she moved from one to the other. In my other moving story, the one I haven’t told you, my Bronco broke down on the side of the interstate not far from Lubbock, Texas, where Talbot grew up. I was alone, and scared, looking at the shadows stretch out from the scrub brush, but in neither one of the stories I’ve related here do I mention the uncertainty of moving, the leaving of one place and finding yourself in another, whether it be New Mexico or a new apartment where pennies have been left on the window sill for luck. How strange it feels to stand in a place so distant from where you were. How there exists a disconnect between what you left behind and what lies ahead. How you’ve changed by the end of the story, how the writer has moved you. How what stories we tell are only the parts we want to recount. What remains is memory, like a red balloon lifting toward the true sky, an image that stays in our sight long after we can’t see it anymore. Paul Crenshaw’s stories and essays have appeared or are forthcoming in Best American Essays, Best American Nonrequired Reading, anthologies by W.W. Norton and Houghton Mifflin, Glimmer Train, Ecotone, North American Review and Brevity, among others. He teaches writing and literature at Elon University.